fifthteenth in a series of Thursday posts about taking tiffin with (black) tea and milk in the NW USA. Panama: The Panama canal was a significant engineering achievement sponsored by the Americans and French prior to WW1. The Panama Hotel dates back to the 1920’s and is based in what has become Seattle’s ‘International’ district. 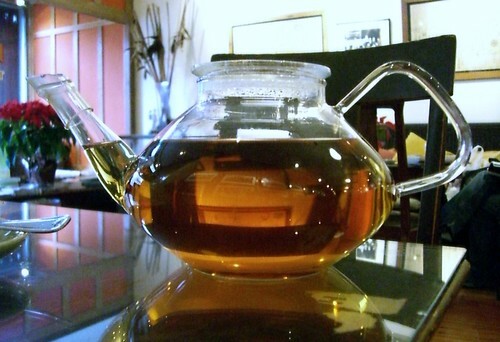 The Hotel’s Tea rooms provide a pleasant mix between oriental and English tea customs. The tea was well made, not stewed, plentiful and upon request an appropriate jug of milk was supplied. Goodnesses: I had advertised that I would be loitering in this Tea house on a Sunday afternoon at 3pm to 12 or so favourite people. To my enthusiastic suprize 8 people* turned up to join in. We were able to arrange to sit around one ‘coffee’ table and share conversation. This made the afternoon really enjoyable. The tea prices were reasonable at $6.00 for a pot of at least 6 cups of tea and some classic (Darjeeling) and interesting (lavendar flavoured) choices. Yummy, naturally I finnished off one pot of Darjeeling all on my own and managed to scrounge cups from friends’ pots! The Tea house provides free wireless access, there were groups of people with Tea and Laptops opened on long tables. The rest rooms were very stylish, though difficult to spot from the outside, not labelled. I accidentally walked into the broom cupboard, perversely this was actually a highlight for me, giggling in the broom-cupboard bought back lots of fun memories. The clientelle looked mainly, but not solely, Asian and of varied age maybe 20 through to my 43yrs. Girls and ….boys…. and sometimes it was difficult to guess…. Discomforts: these were miner, I feel a bit churlish even mentioning them. The shiney wood floors and some of the hardwood seats gave the place aslightly cold, uncomfortable edge. I kept my coat on to stay warm and was lucky enough to find a seat on a soft sofa. This scribble was published on Thursday, January 18th, 2007. You can follow any banter on this scribble with the RSS 2.0 feed. You can share your inspired musings after typing the anti spam word near the bottom of the page. But no Pinging because its too naughty. Nice note on tiffin at Panama, thanks — tea time is great! Here are my two favorite tea houses. If you’re ever in Boulder, check out the Dushanbe Tea House http://www.boulderteahouse.com/. Don’t bother with the Palace in sf. Nice room, but they serve stale bread and a short tea list.